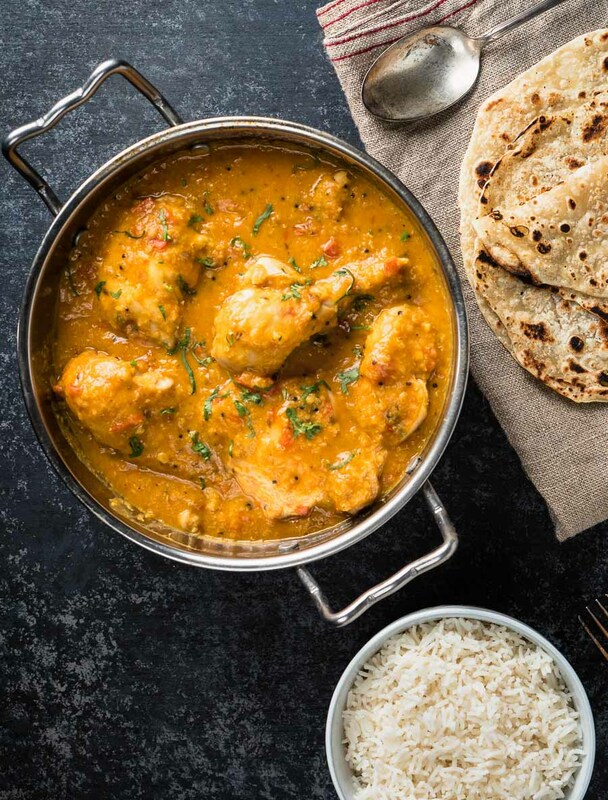 Chicken dhansak is a timeless Indian dish where the humble lentil is transformed into something wonderful. Overlay some big Bengali flavours and it might become a new classic. Heresy? Maybe. But I like it. A lot. Because it’s just tasty. And it’s way easier than the original. That’s a dish meant for Sunday dinner. For special occasions. Serious business. This is easy. Chicken dhansak for weeknights. Takes a while to get the lentils cooked. But other than it’s a snap. Make the lentils one evening. Set them aside. Finish it the next night. No rush. No pressure. Or make it in a single evening. Totally doable if you start early enough. 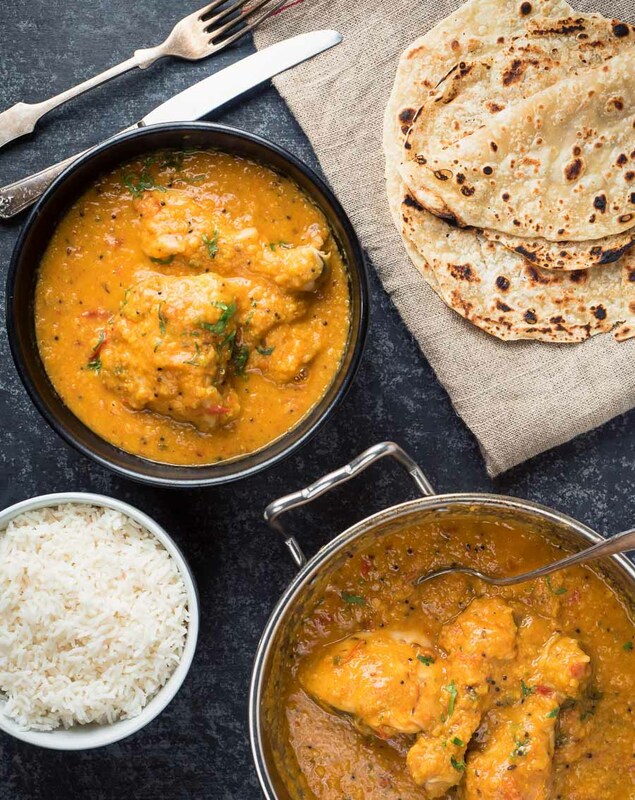 This chicken dhansak is a hurry up and wait kind of recipe. Most of the time is spent watching it cook. Or doing other stuff. Lentils take a while to get to mush. And mush is where the magic is. That mush is the sauce. The creamy coating that wraps every bite of chicken. Perfect for dipping Indian flatbreads into. Mush into magic. That’s what this is about. The flavour profile is different from classic chicken dhansak. Bengali flavours. Mustard seed. Cumin seed. Panch phoran. I think the only thing that could make this more Bengali is if you put potatoes into it. Panch phoran is going to take a trip to an Indian grocer. Count on that. But that’s always the case with Indian recipes. There are lots of other things to get. If you are getting into Indian cooking you will need to start collecting spices anyway. Panch phoran is Bengali five spice. A blend of whole spices. Cumin. Mustard seed. Fenugreek. Nigella. Fennel. Somehow these five spices come together into something that just works. Perfectly. Once you try it you’ll understand. It comes pre-mixed so just pick up the package labeled panch phoran and you are golden. Bone-in chicken makes a difference. And dark meat is always better for braised dishes. Two things you really need to stick to. Play with the spices. Try different things. But make sure that you use dark meat. On the bone. The chicken cooks in the lentils. The juices from the chicken become part of the sauce. That’s important. Really brings it together. Puts the chicken into chicken dhansak. Boneless chicken breast just cannot compete. Try the lentils after you add the tomato mixture. Then try it once the chicken is cooked. You’ll see. Before – lentil dish. After – chicken dhansak – Bengali style. This is homestyle cooking. Not what you get in restaurants. What people cook for family. For good friends. 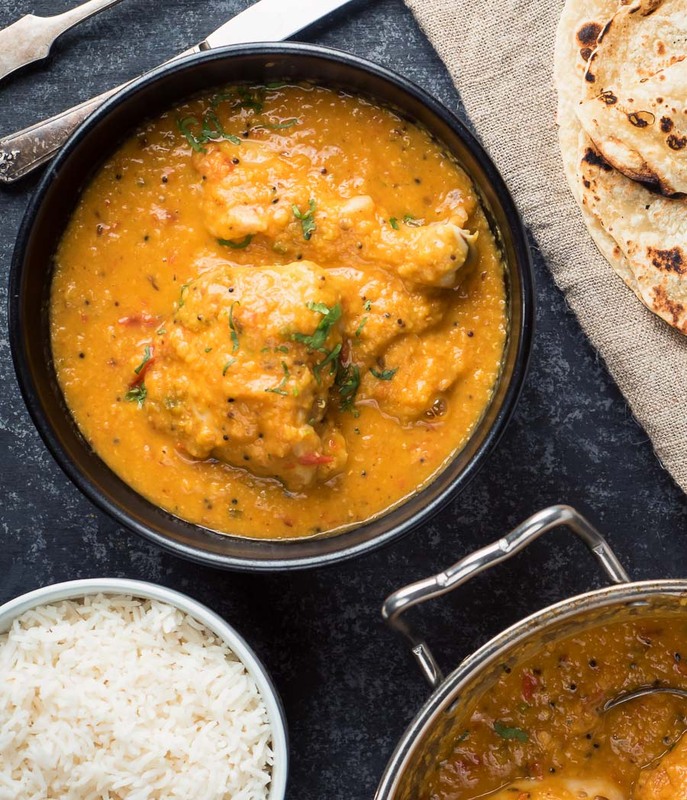 There are lots of flashy restaurant style dishes on this blog – including a dhansak curry. But sometimes comfort food is what you need. And this is comfort food. 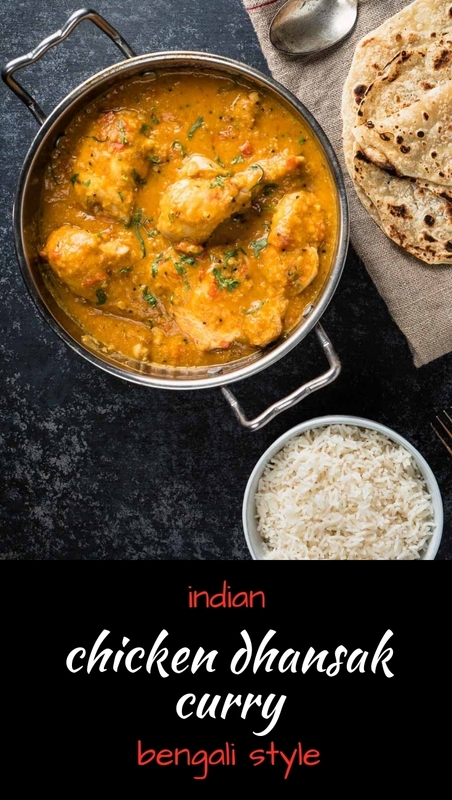 If you like Indian. And you like lentils. 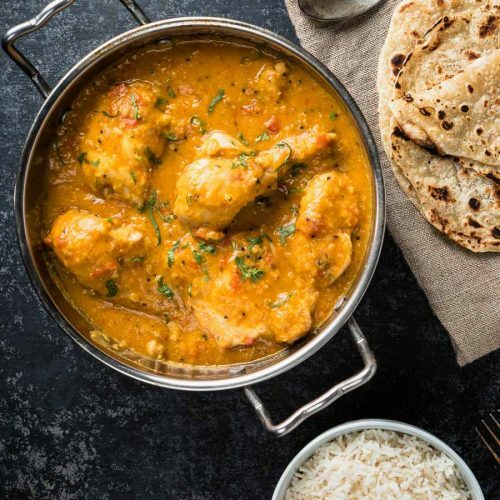 This chicken dhansak could be just what you need. Easy. And really tasty. How can you go wrong? 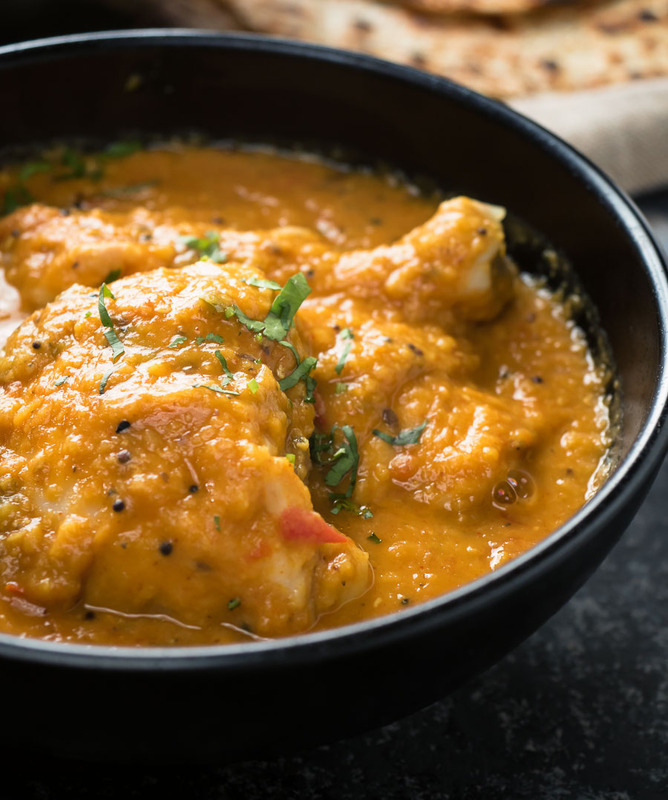 Chicken dhansak bengali style is a different take on a Parsi classic. It's less work and just as tasty. 1 1/2 tbsp garlic ginger paste - make your own following the link below. It's so much better than store bought. 2 green finger hot chilies seeded and diced. Or one jalapeño, seeded and diced. 1 tsp kosher salt to start - you will need more. Combine the lentils, water and turmeric in a pot large enough to hold the final curry. Bring to a boil, reduce the heat and simmer until the lentils are mushy. You want to bring them to a boil uncovered and then cover when you reduce to a simmer. I've had lentils boil over more times than I care to mention. Messy stuff. Give them a stir every now and then while they cook. Sometimes they stick to the bottom a bit right when they get to the mush stage. Keep an eye on them. They will cook more with the chicken. Ultimately you want the lentils to fully disintegrate. A little thick at this stage is OK. The chicken will throw some liquid as it cooks. Heat the oil over medium heat in a skillet. Add the cinnamon and cook until little bubbles form around it. This takes 20-30 seconds. Now add the mustard seed, panch phoran and cumin seed. Cook until they start to sizzle. Again, this takes only a few seconds. Reduce the heat to medium low and add the diced green chili. Cook for 30-45 seconds. Stir in the garlic ginger paste and cook until it stops sputtering - around one minute. Now add the kashmiri chili powder and salt and cook for 20-30 seconds, stirring continuously. Mix in the diced tomatoes. Cook, stirring occasionally, for 3-4 minutes. You want to get them to where they are just starting to lose their shape. Add the tomato mixture to the lentils. Stir to combine. Taste and adjust salt. It's easier now than when the chicken is in your way. Add the chicken to the lentil mixture. Cook until the chicken is cooked through. An instant read thermometer is good for this. You are going for about 170F in the middle of the thigh. Let stand for about 5 minutes. Taste for salt. 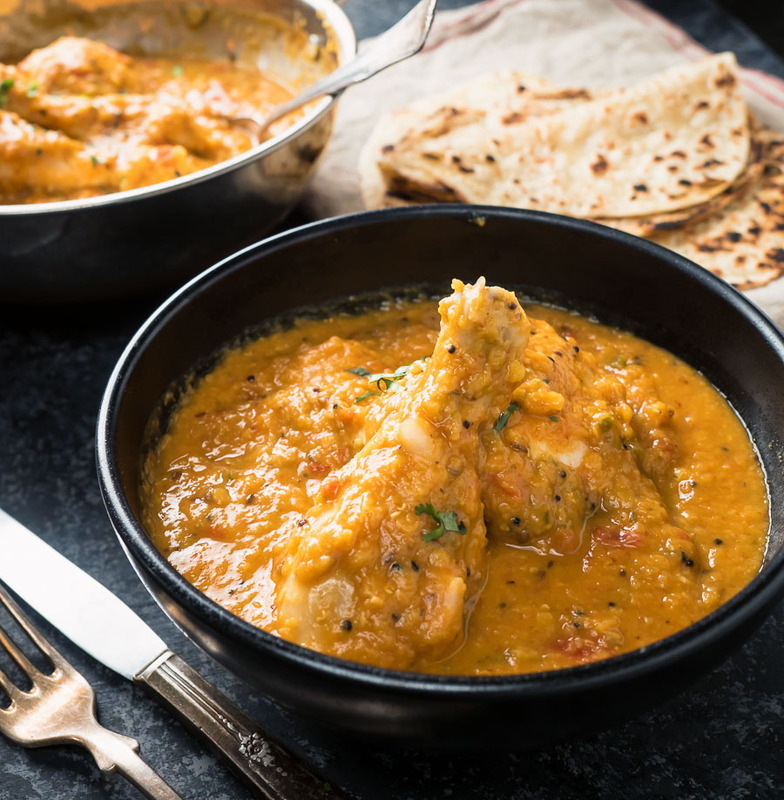 Serve with rice and/or Indian flatbread like naan or chapatis or best of all parathas. Mmm... parathas. This recipe works with fresh tomatoes. If you use canned tomatoes think about adding a little bit of lemon or tamarind to the dish to brighten it. I love the combination of chicken thighs and lentils! This looks so comforting and delicious! This looks really delicious! Dhansak is one of my favourite curries. Many thanks for sharing the recipe. Thanks.